"Bands that make great music do so with lots of practice, a keen sense of vision, creativity, and the ability within the group to listen and play parts. The same holds true in great organizations. Jeff and Dan understand this, and do a great job of communicating the magic that occurs when individuals within an organization tune up, tune in, and listen to each other playing their directed parts. "LARRY THOMAS, chairman emeritus, Guitar Center Inc.
Jeff Carlisi was one of the founding members of 38 Special and wrote or cowrote many of its biggest hits, including "Second Chance," "Caught Up In You," and "Hold On Loosely." The band sold over 14 million records and enjoyed worldwide popular and critical acclaim. Jeff left the band in 1997 and is now one of the cofounders of Camp Jam Inc., where he trains young musicians and conducts team-building workshops for corporations. He is a member of the Rock and Roll Hall of Fame's house band. 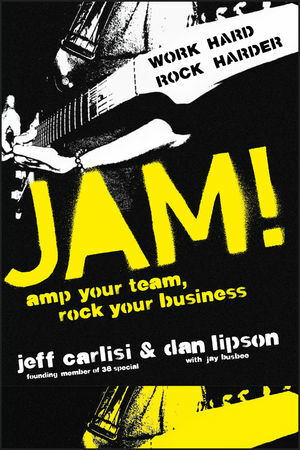 Dan Lipson is president and cofounder of Camp Jam Inc., which includes rock and roll camps for adults and children, as well as corporate team-building exercises, and Jamling.com, a virtual band community site. Previously, he was president of Leading Edge Promotions, CEO of Causelink.com, CEO of ExL Corp, and general manager of Home Entertainment at ESPN. Jay Busbee has published more than a thousand articles in national magazines, websites, and newspapers, including Yahoo!, USA Today, and the Washington Post. 3. Band on the Run. 7. Welcome to the Jungle. 8. Just What I Needed. 9. A Change Is Gonna Come. 10. So You Wanna Be a Rock `n’ Roll Star. 11. New Kid in Town. 12. It’s the End of the World As We Know It. 14. No Particular Place to Go. Encore: A Camp Jam Crash Course.